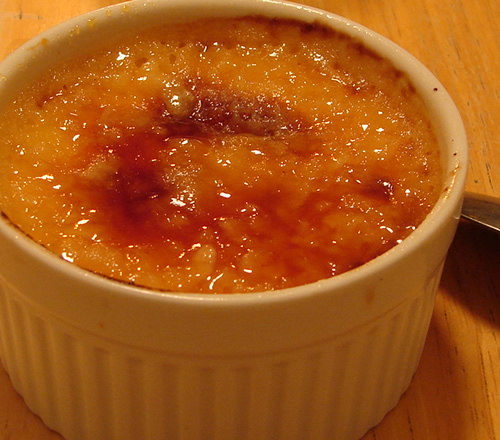 The baked custards are a nice finishing touch to a meal. Preheat oven to 315 degrees and grease 4 ramekins. Whisk eggs and sugar in a large bowl. Heat milk and cream in a small saucepan over medium heat for 4-5 minutes. Add to the egg mixture with vanilla and strain into ramekins. Sprinkle with nutmeg. Place the dishes into a large roasting pan with hot water halfway up the side of ramekins. Remove from the pan and let sit for 10 minutes before serving. This rice pudding with oranges and cream (Ris à la Malta) is a traditional Swedish dessert that's usually served around Christmas time. It's made with cooked rice porridge that you need to prepare ahead of time. It's a rather nice dessert that's refreshing and pretty light, and it can be made up to a day ahead of time. Whip the cream with sugar and vanilla until you have hard peaks. Peel and cut the oranges in small pieces. Combine the cream with the rice porridge, the oranges and sprinkle sliced almonds on top. Serve immediately or keep well covered in the fridge. I wanted to make a special dessert for Father's Day, something we haven't had in a long time but still delicious, homemade, light and summery. A dessert that complemented our tasty BBQ dinner. My mother used to make a wonderful angel food cake with cherries and whipped cream, so that was the inspiration for this dessert. So the first thing was to purchase an angel food cake pan. Since the recipe called for about 16 cups filled, I knew I wanted something larger than the one I had. I had read some reviews about pans but finally I purchased a 2 piece tube pan that worked out perfectly. The recipe was really easy and I made sure I had everything on hand. I wanted a whipped cream icing to make it a little more special instead of a glaze, so I folded thinly sliced strawberries into the heavy cream. It was a little tricky and should I say messy and thick, but delicious. I also added whole strawberries to the top and around the plate for a little color and texture. It certainly tasted better than it looked and now it's sure to be a favorite - with or without the whipped cream. Fluffy, airy, delicate and simple comes to mind for this angel food cake - the recipe came from America's Test Kitchen, since they're always so dependable and solid. Line a tube pan with parchment paper on the bottom, but do not grease. Whisk flour and 3/4 cup sugar in a medium bowl for later. Whip the egg whites in an electric mixer until foamy, (low speed) then add cream of tartar and salt. Increase speed, adding 3/4 sugar slowly until shiny, then add lemon juice, vanilla and almond extracts. Invert over wine bottle ( the wine bottles I had wouldn't fit - so I turned it on its side for a few minutes and then using a knife pried the cake out. Whip the cream and sugar until soft peaks appear and then fold in strawberries with a spatula. Rhubarb features such an interesting flavor: it's acidic, a bit tart and definitely needs a bit of sugar, but once you add that, then you're in for a lovely and unique flavor experience. Here we have cooked rhubarb into a compote, which is wonderful to serve on it's own, with a bit of whipped cream, over yogurt, over ice cream, in milkshakes - you name it! Let cool and store in the fridge. We first learned about the recipe watching America's Test Kitchen and wanted to give it a try. It came out really well, although I don't think you have to be so careful as they are about every detail. The cake will come out great if you follow the basic instructions. It did go very well with coffee. The two things we did learn though are to not over-mix the crumbs and not to cook it as long as the instructions stated. I think 25-30 minutes in a decent oven it plenty. In a bowl combine white sugar, brown sugar, salt and cinnamon, mix well. Add the melted butter and stir until smooth. Add cake flour and stir until combined. Covered with plastic wrap and set aside on the counter for 10-15 minutes. This allos the gluten to relax. In a standing mixer, combine flour, sugar, salt and baking soda using the paddle. With the mixer running on medium-low, add the butter 1 tablespoon at a time, waiting until each piece breaks down before adding the next. Continue mixing until it has a uniform sandy texture. Add the vanilla, buttermilk, egg and egg yolk. Run mixer on medium-high until batter is smooth and thick, at least 1 minute, or use a handheld electric mixer. The batter will be very thick, almost like frosting. Butter and flour an 8 x 8 inch pan, or use a non-stick spray. Cut a piece of parchment paper, and lay it into the pan, allowing 2 inches to overhang each side. Spread the batter into the pan. Break the crumb mixture into pieces and spread the crumbs around the outer edge of the pan first, then evenly fill in the center. Place the pan in the oven for 25-30 minutes, or until a toothpick inserted in the center of the pan comes out clean. Cool cake in pan for about 30 minutes. What a gooey and wonderful dessert we had the other night. It all began when I was looking for an easy dessert perferably with chocolate to accompy our chicken marsala dinner. Well, it couldn't have been better or more pleasing. A cross between a brownie and pudding said the recipe and boy was that accurate. Messy and delicious, rich and calorie ridden this dessert was fun and filling. The Barefoot Contessa sure knows how to please a crowd. I would surely make this recipe again and next time invite over a few more people so I won't eat all the leftover brownie/pudding myself! I added a scoop of ice cream for a few more calories but a dollop of cream would also work. I followed the recipe and it worked out fine - easy, gooey and syrupy works great every time. I coated a 9 X 12 X 2 inch oval dish with butter in a 325 degree oven. Melted the butter and then let cool. In an electric mixer I beat the sugar and eggs until light and thick. Sift the cocoa powder and flour in a small bowl. I added vanilla extract as I didn't have a bean and no liquer then added the cocoa mixture until combined and added the cooled butter. The picture of the Barefoot Contessa's was a bit more of a brownie whereas mine was a little more gooey. Maybe the oven's were off but still a nice dessert to serve with ice cream and a cappuchino. Farmer's Market had a beautiful selection of berries this season, so of course I couldn't pass up some red raspberries for a lovely dessert to complement our meal. Tasty and delicious the raspberries are also colorful and fun. I had recently seen the Food Network and Ina Garten (Barefoot Contessa) who is also, one of my favorite chefs, created a beautiful dessert with raspberries, cream and meringue. Well, I too recreated this wonderful and easy dessert - and what a hit. It not only looks great but it is great. I strongly recommend this simple and elegant after dinner treat. I heated about 2 pints of rasberries, 1 cup sugar, lemon zest and juice in a saute pan for about 10 minutes over medium heat til syrupy. I didn't have the liqueur so I just skipped it. Cool the mixture. I whipped about 2 cups of heavy cream with the sugar and vanilla( it was too much --do about 1 1/2 cups). Then I crushed some meringue pieces to add some texture. Layer into glass dishes or bowls ( my dishes were a bit smaller than her recipe called for). Nevertheless - it really doesn't matter. The delicious dessert was perfect with a chilled white or sparkling wine. If you have extra blackberries on hand, then this would be an excellent way to use them. Making a clafoutis is an easy and delicious way to use this fruit. Here we made a recipe that's perfect for 4 people, it makes a smaller amount than the plum clafoutis we made previously. Clafoutis is such an interesting dish. Made right, it's smooth and creamy and taste very custard-like, however it doesn't require a water bath to cook it. We have also chosen to beat the whole eggs at one time instead of separating them and beating the yolks and the whites separately. To separate them probably produces an even fluffier and lighter texture, however sometimes you just don't feel like taking that extra step or doing the additional dishes, and then it's nice to know that this simplified recipe turns out oh so delicious. Heat the oven to 350 degrees. Whisk the eggs in a mixer and add the sugar. Beat until light and fluffy, at that point add the vanilla, lemon zest, flour and cream/milk. Mix on low speed until combined, but don't overdo it! Set aside and let sit for a few minutes. Butter a pan - we used an 9x9 glass pyrex dish. Sprinkle sugar on top of the buttered surface and add the berries. Pour the batter on top of the berries. Bake in the oven for about 35-40 minutes, watch carefully at the end, you don't want to cook it too long or the clafoutis can curdle a bit. Let sit for awhile before eating, ideally at least 30 minutes. Either enjoy warm or at room temperature. Having come across a nice amount of yellow plums, I was thinking of what to do with them. Immediately the concept of a clafoutis entered my mind. A clafoutis is something of an in-between cake and custard dish, which is commonly made with cherries in France. It's easy to make and is really great with all kinds of fruit, so why not try it with beautiful, ripe plums? It turned out really nice; the flavors of the plums really accentuated the dish. This is great to do a little while in advance of a dinner party, it's really nice to serve slightly warm or at room temperature. This is a very simple recipe, all the ingredients are mixed in one bowl, no whipping the egg whites separately as some other recipes require. Be careful not to bake it too long however; if you overdo it the eggs can curdle, so it's important to almost underdo it and let it settle, as opposed to overdo it. In a mixer, whisk the eggs together well. Add sugar and beat for a few minutes until nice and frothy. At this point lower the speed and add the zest, vanilla extract, flour and half and half. As soon as the batter has come together, stop beating it. You don't want to overdo it. Leave the batter to settle. Now tend to the fruit. Wash, halve and remove the bits and cut in pieces. Butter a pan (I used a 9 1/2 inch oval Le Creuset pan, however an 8x8 pyrex would also work nicely) and sprinkle it with sugar. Divide the fruit in the pan. At this point pour the batter into the pan. Bake in the oven 35 - 40 minutes, watching closely at the end so as to not overcook it. Let cool for at least 30 minutes or so before enjoying. My mother used to make this chocolate wafer ice box cake way back when... I have such fond memories of this delicious whipped cream cake that I decided to make it again for company. I read a blog recently where someone made this cake and complained about it being grainy and soggy - I guess she doesn't have my same memories. Anyway, this was always one of my favorites. So easy to make and what could be better than whipped cream! A nice addition is to add fresh fruit, chocolate shavings, chips or nuts. This dessert makes a nice presentation for a party or lunch especially with a glass of bubbly.